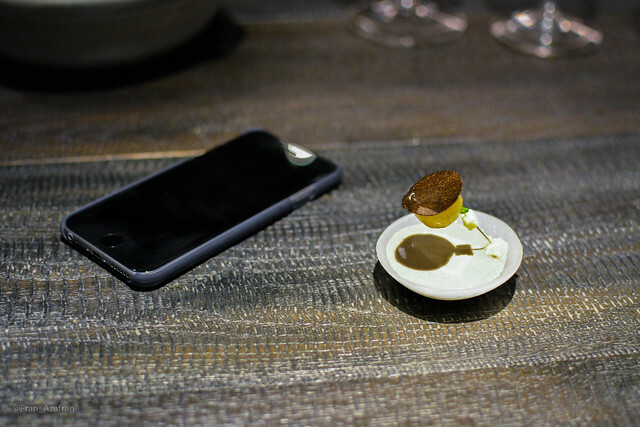 How is it to be in a 3-star Michelin pop-up restaurant. The first restaurant in Chicago to score the highest of ratings from the red guide closed its doors a few months ago. But don’t panic. They’re doing renovations to their building and revamping the whole experience to come back later this year. 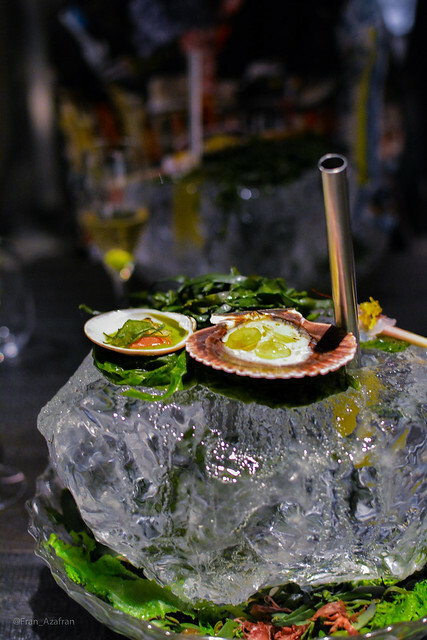 In the meantime, joining into the rising wave of ‘touring’ top restaurants – Noma in Tokyo and Syndey; The Fat Duck in Melbourne – Grant Achatz moved his to Madrid. The entire staff – 47 strong, if I remember correctly – relocated to Spain for a month to deliver the Alinea experience in a new context, merging their boundless modernist take with Spanish traditions and paying tribute to their products. I scored two seats back in December when they went out for sale on their reservations platform and I convinced one of my friends to come with me. 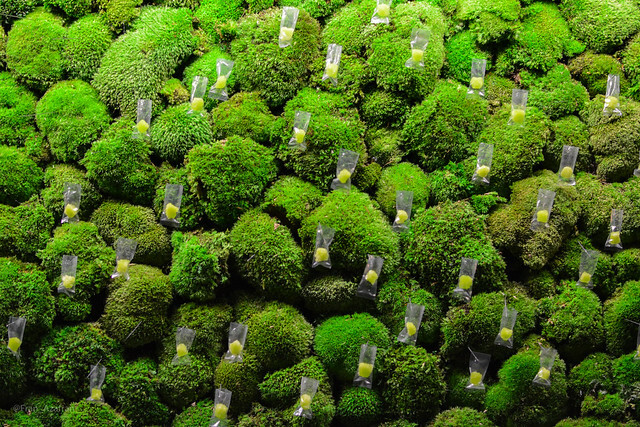 The residence would start with a collaboration menu with David Muñoz from 3-star restaurant DiverXO for a week or so. 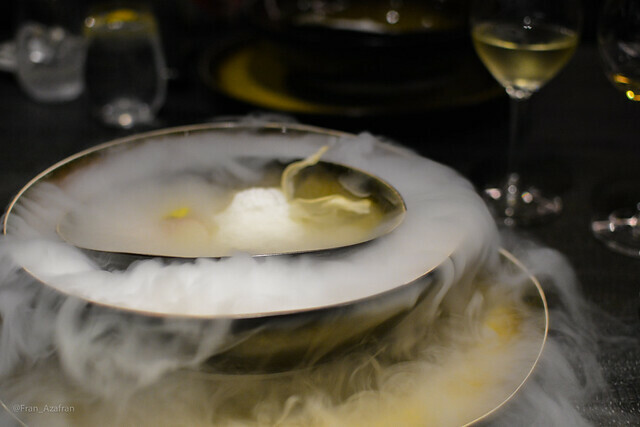 Since I had never made it to the original spot in Chicago, I decided a pure Alinea experience was most suitable for me. So I proceeded to pay my €440 (275 for the menu, 125 for the standard wine pairing and 10% tax) and sit down for the long, long wait. Two cold months later, the day finally came. I have all kind of cool (okay, geeky) remarks on how the dinner went that night. But how ‘bout I just walk you through the whole thing and explain on the way? Walking into the restaurant, the first thing you notice are the dark-carpeted walls, with patterns of gigeresque tentacles. Then we turn right. This is our living wall. Please choose a flavor packet and take it with you. 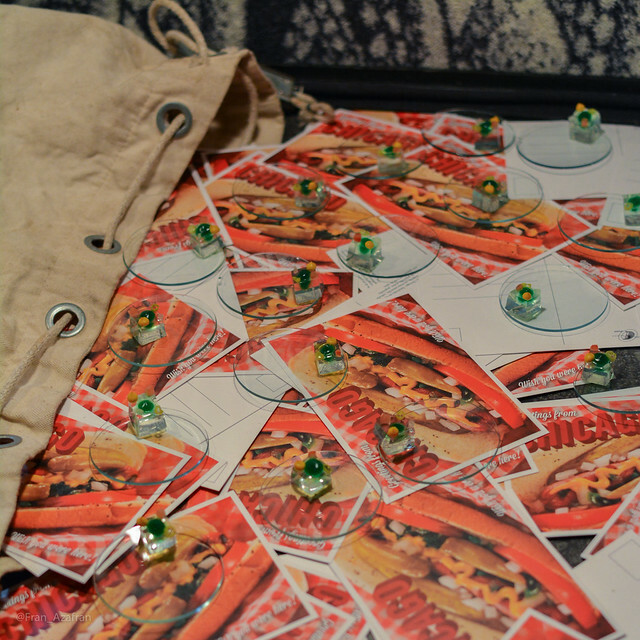 I lean in and notice dozens of small plastics bags, each holding some kind of bright green crystal. I take one and wait for further instructions. This is our champagne bar. Please deposit the content of the bag in the glass, discard the bag in the container in the middle. We wanted to bring Chicago with us, and here you will experience the full flavor of the classic Chicago hot dog. On a watch glass I see a tiny piece of colorless jelly, adorned with a few drops of red, yellow, green. So I take it. It was like having a full bite of a delicious hotdog… sausage, jalapeño, onions, tomato, mustard, maybe even the bread. Maybe my brain filled that in. I’ve read lots about how flavors and aromas can be distilled into water or alcohol using modern techniques – with a RotoVap, for example – but I never had the chance to actually taste something like it. Actually, I still don’t know how it was made, but, you know, I’m assuming. An iceberg sized block of ice holding many elements, only after a few seconds of observation I could break down the dish. 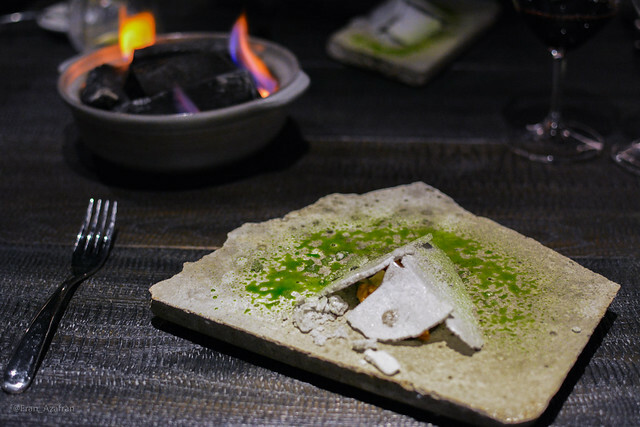 On the left side was a smooth clam with salsa verde; to the right, zamburiñas (scallops) on the shell with white gazpacho and grapes; just behind was a slice of snapper sashimi on a lemongrass twig, later to be cooked to taste over a hot stone they would place on the seaweed in the back. Finally, the metal tube performed as a straw to drink a delicious pineapple-star anise juice hidden within the ice. Flavors were sharp, bright, fresh, clean. But I have to say, it was sometimes hard to concentrate on the flavors while fighting the bewilderment of the theatrics and stunning beauty of the presentations. It has been discussed for years, and recently starting to be scientifically proven, how surroundings affect our perception of taste. Rather than complaining, I’m trying to point out how immersing the whole concept is – as soon as you walk through the main door, you’re transported to a different place, maybe different time. Every detail counts. I assure you, those flavors are unique, not strictly because of how they were cooked, but because they were influenced and magnified by the magic around them. The following course came in 3 parts, a tribute to Spanish latería – cans and jars. 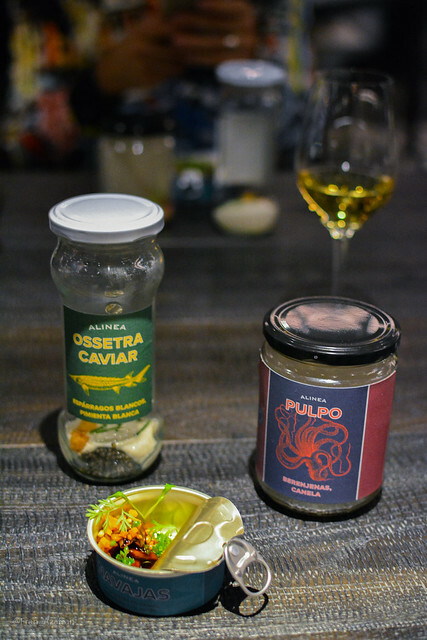 On the left, ossetra caviar, white asparagus and white pepper. Caviar, cream and espuma. In the middle, razor clams, coriander and carrot, in an intense dark sauce. To the right, octopus on a burning cinnamon stick and eggplant puré. Every bite was perfect. For our next course, we honor one of our favorite Spanish artists. 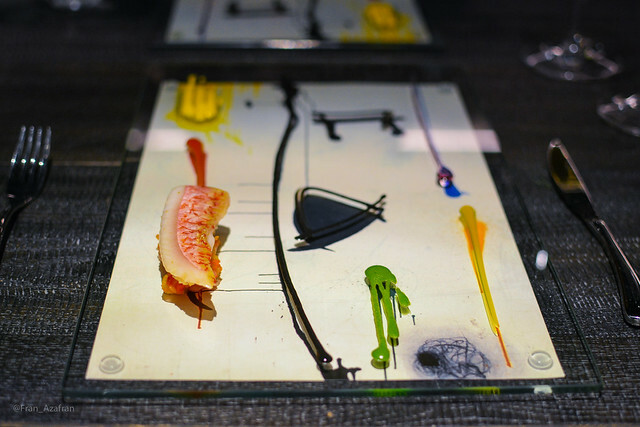 A print of Miro’s June 2, 1973 painting came to the table, instead of a plate. Immediately after, a glass plate was placed over it, with every food element matching the painting, making one of the most beautiful scenes I’ve ever seen. The fish was stunning, almost unlived-up-to, except that the next day I had a similarly outstanding dish, but more on than later. With it came saffron alioli (top left), padrón pepper (green), orange (bottom right), squid ink (I believe) and a syrupee purple element that I couldn’t quite place. During the next course I finally started recognizing some of the signature elements of Alinea’s design – the Porthole came filled with an infusion of citruses, poured then over dry ice hidden underneath a bowl of langoustine and sea bass ceviche (or so it was described to me), with tiger’s milk-coconut foam, tapioca pearls avocado and chile. The coconut foam was so intense and flavorful that for a second I thought it was the main element of the dish. With the next course, again in 3 parts, came more iconic design pieces. 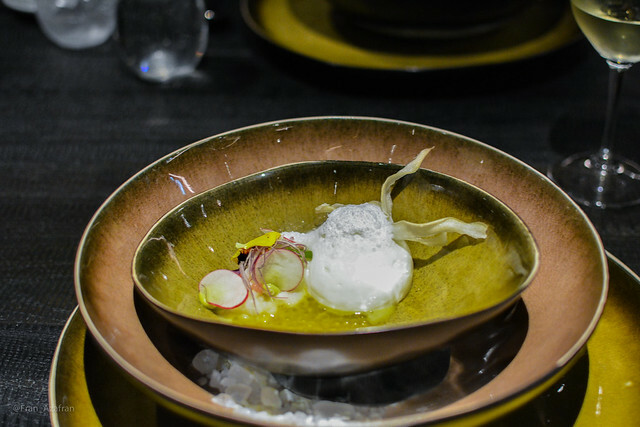 In fact, from this point on, the menu became almost entirely the quintessential Alinea. 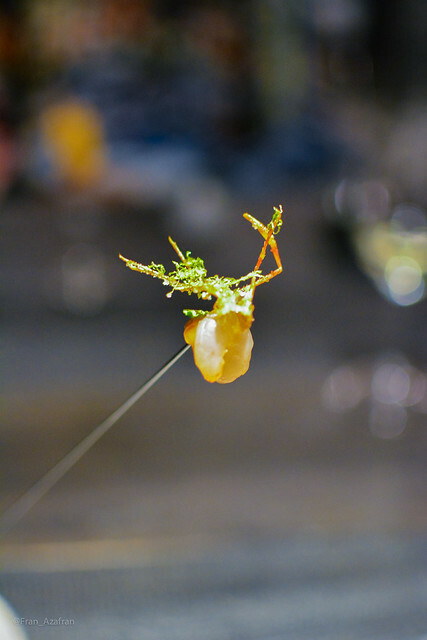 The Antenna – holding the head of a baby shrimp with tamarind, mint and szechuan. One of my favorite bites of the evening. On the eye came served a frozen and microscopic version of a Siam Sunray, a rather classic thai cocktail – coconut, lemongrass, chili and soda. 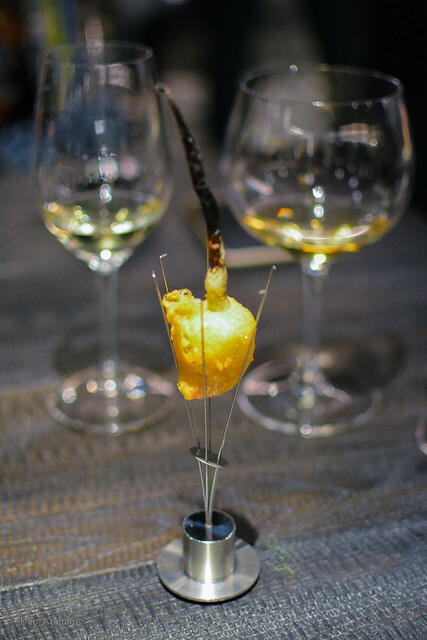 Finally, piece of tempura crab on a vanilla pod skewer came served on the Squid. Amazing. 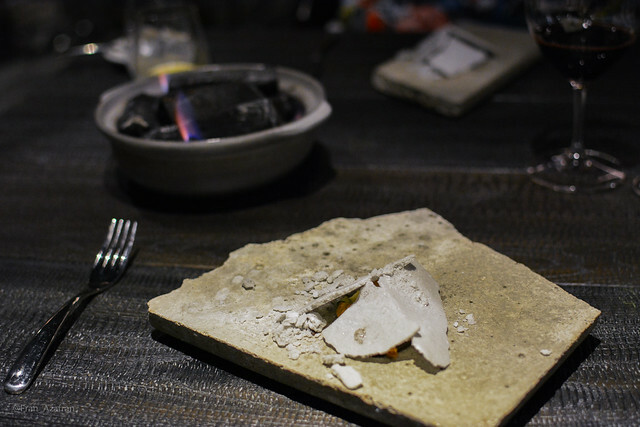 A bowl of charcoal came to the table, unannounced, and was lit up with a handheld blowtorch. As it burned, the next plate was served. For our next course, we go back to Chicago once more. Street art is remarkable in our city, so we made it into a dish. Served on a piece of cracked concrete was what looked like another piece of cracked concrete. It actually was a merengue of porcini mushrooms, covering more wild mushrooms. Then the waiter pulled out a can of spray paint and painted over the dish with a tarragon sauce. 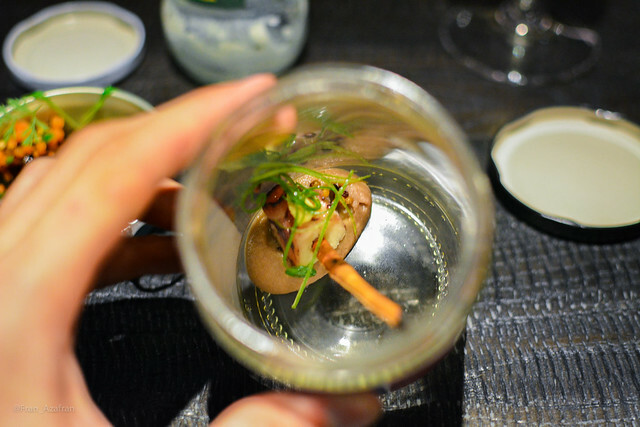 The most remarkable element of the dish was the merengue – one is not used to taste this kind of texture on a savory, umami-filled dish. This one is just a direct blow to the senses, a simple potato cream elevated with black truffle juice, served on a custom made wax bowl. To eat it, you carefully pull out the skewer out of the bowl and watch the garnishes fall into the soup, and then devour in one sip. 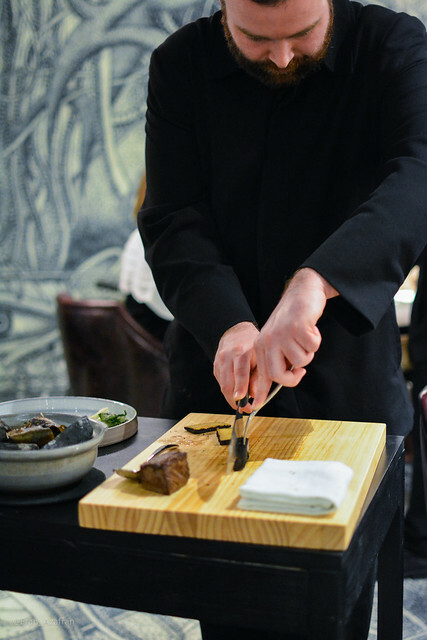 On the skewer there’s parmesan, butter, chive, a pearl of potato cooked deep in clarified butter and topped with a decadent slice of black truffle. (How I know the details of the recipe? Just because I bought the Alinea cookbook years ago). Umami, umami, umami. Oh, man. Remember that bowl of burning charcoals? This is your next course, goes the waiter, while emptying the bowl onto a beautiful wooden board. One of these is actually not charcoal, but charred potato, he continued as he cut it in thick slices. 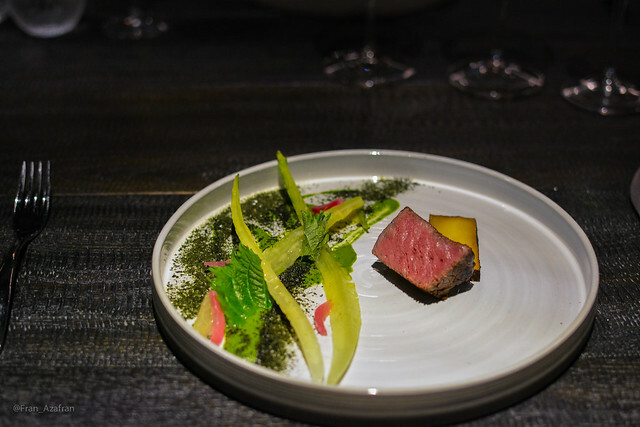 A piece of wagyu beef wrapped in leaves also came out of the bowl, and was also sliced to show off its rosy perfection. It was finally placed on the side of a lettuces and seaweed salad. The quality of the beef was outstanding, soft but showing integrity to the knife. Every bite as flavorful as an entire cow. Then, another staple. The black truffle explosion. It had been on my list of most wanted dishes in the world since the dawn of time, and I finally got to taste it. It comes served on the antiplate, resting on a spoon. 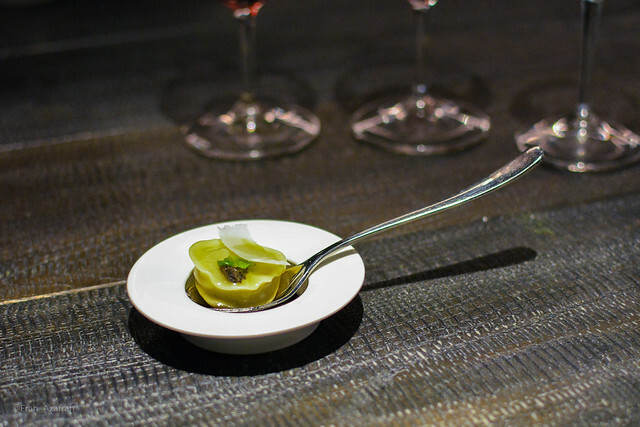 A ravioli filled with a once solid sphere of black truffle juice and butter, lots of butter. The filling is liquid, so you’re advised to seal your lips after eating the ravioli in one bite and have your mind blown into the 5th dimension. 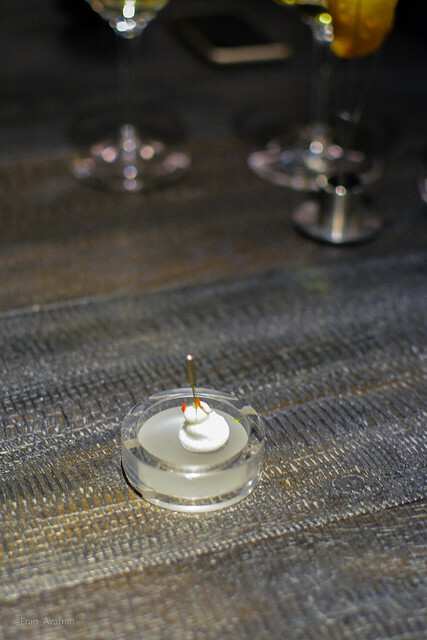 More recognizable Alinea elements were still waiting for us. On to the table came a slice of paper thin bacon, with some butterscotch and an ethereal apple filament wrapped around it – the whole thing was hanging from the bow. 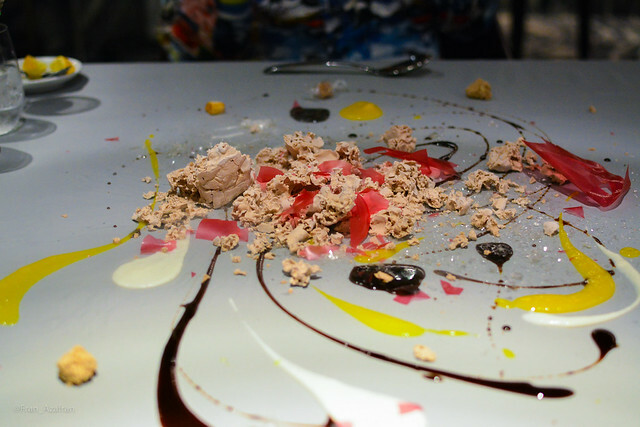 As beautiful as this dish was, it’s fair to say it was also the least memorable. A higher temperature might have helped to release more flavors from the bacon fat, then again I realize how difficult it must be to control temperature on such a delicate piece. This course also marked the end of the savory dishes. The pre-dessert came floating to the table. That’s right. A helium filled-green apple edible balloon was handed to each of us. We were warned of its stickiness, and they strongly recommended that I removed my glasses before going in. So I did, and then burst the balloon while breathing in the gas inside. At some point, the whole restaurant was laughing, not just at me speaking in a SpongeBob kind of voice, but also at a gentleman on the next table who was doing a whole stand up routine while under the effects of the helium. It was fun. A lot. I know, I was speechless too. In case you couldn’t hear, the elements of the plate are bitter cocoa and rum, allspice, mandarin-orange, milk chocolate (frozen), caramelized banana, hazelnut, sherry caramels (in an edible wrap) and, remember that pink ‘glass’ hanging above our table? Well, that was the final element to go on the table, pink grapefruit. I think it was Chef de Cuisine Simon Davies who plated our dessert, but don’t take my word on it, I was way too excited with the show to even take a look at him. Mr. Achatz was already back in Chicago to oversee some complications with the construction at the restaurant. Or so I was explained after asking for him. What a pity. One more thing before I close. 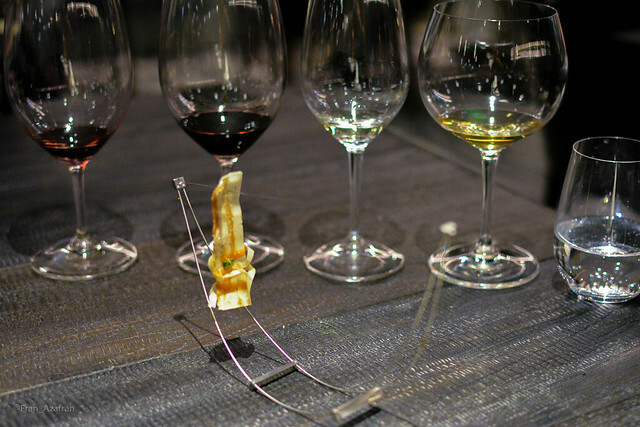 I haven’t mentioned the wine pairing at all, and it deserves at least a few lines. 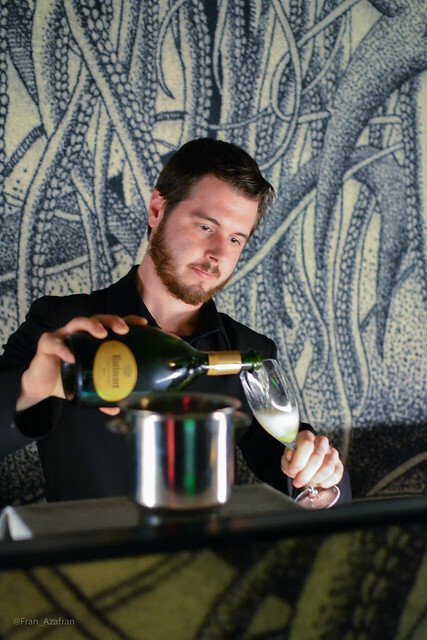 Almost every wine I was served was unconventional and remarkable. But the actual pairings were brilliant. After almost every glass I felt the need to praise the sommelier for making such splendid choices. 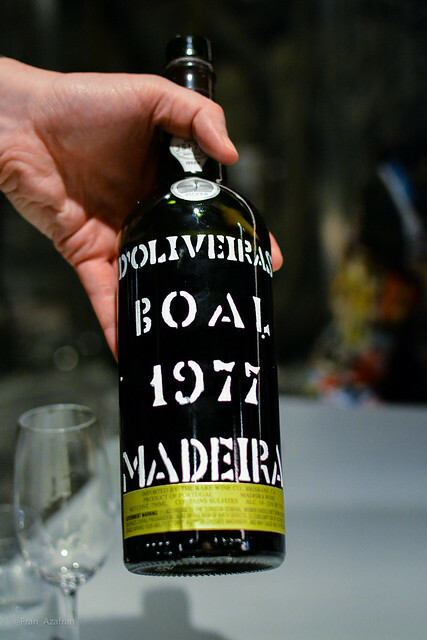 On the side of amazing wines standing by themselves, I had a glass of fantastic 1995 Roda I Rioja, and a rich 1977 D’Oliverias Boal Madeira that won me over, as I’m usually not one of sweet wines. D’Oliveiras is one of the oldest standing houses in Portugal. This is a 1977 and it’s just a baby. That concludes my walkthrough of Alinea Madrid. A fascinating night with only one setback, the absence of the man. Still, as I left the place, my heart was beating like a drum. I was drunk on excitement. And 7 glasses of wine. I'm all about food. Home cook and Food Blogger. Have my new posts delivered to your inbox.